This CD contains 30 minutes of old atmospheric, organic and dark Noisescapes, which were once intended to be released as Blank Banner-material on a Split-LP with Third Organ, what never happened due to financial problems. 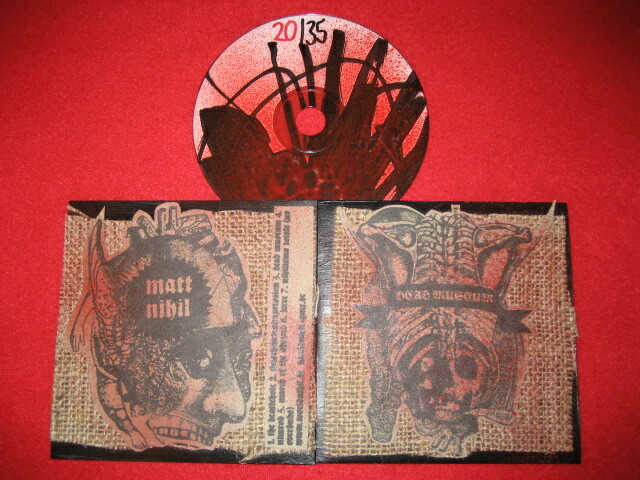 INFO: Matt Nihil is a side project by MM Mrs. World Nihil aka. Iron Youth, Black Light Orchestra ,Birkenau, THE 120 DAYS, King Drecksack !!! Genre: Harsh wall-inspired *Noise electronics. Customer evaluation for "Matt Nihil - Dead Museum CDr (Lim35)"